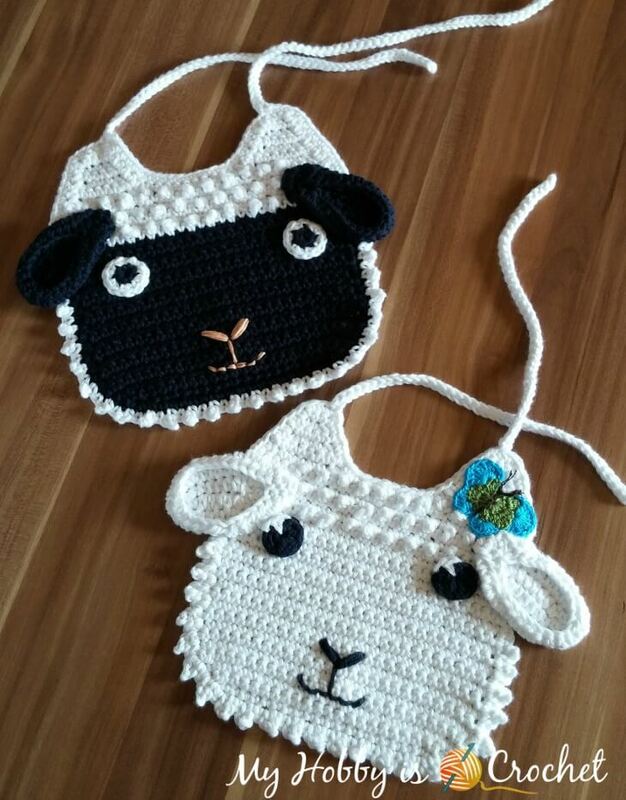 These lamb baby bibs were designed by me while pregnant whith my baby girl. Don't they look sweet? They melt my heart every time I see them! :) I hope you will love them as much as I do! 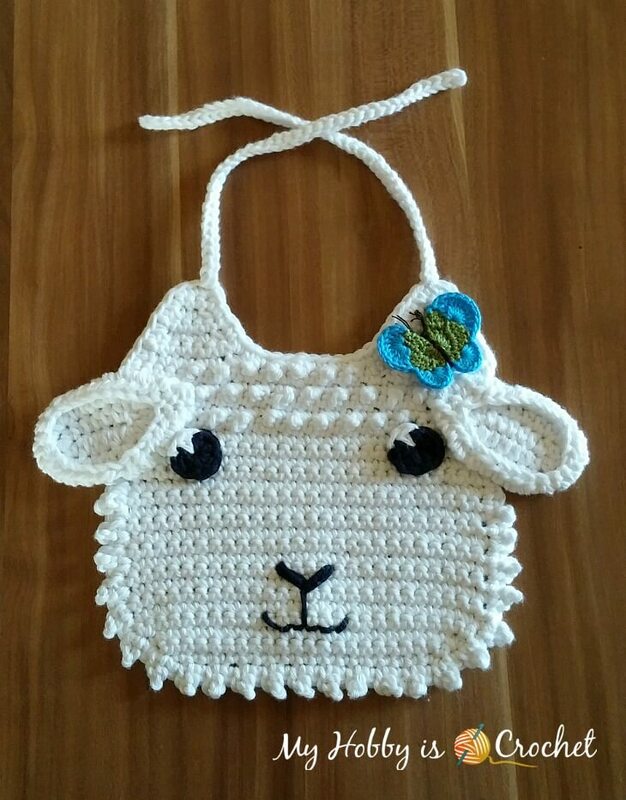 This sweet crochet lamb bib would make a nice Easter or baby shower present. The butterfly applique is optional, a sweet embellishment for baby girls. 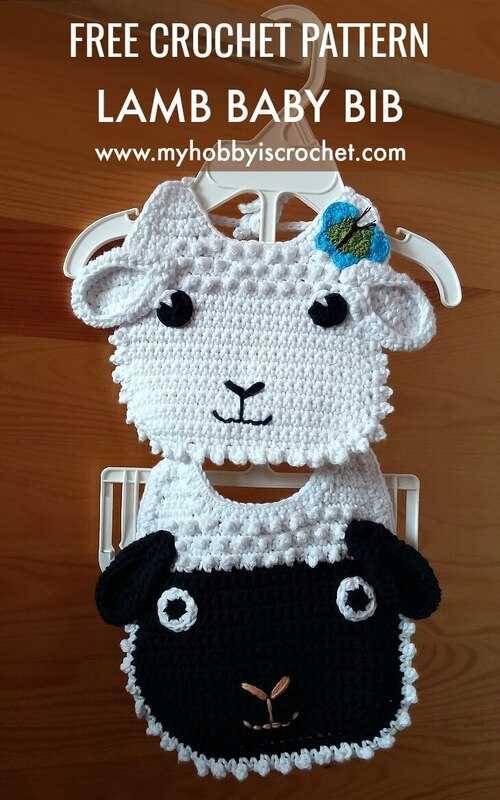 You can make the bib in one solid color, or try a two color version. sc2tog: single crochet two together: Insert hook into stitch and draw up a loop. Insert hook into next stitch and draw up a loop. Yarn over, draw through all 3 loops on hook. The Picot Single Crochet (psc) it's worked from the wrong side of the fabric and it will pop out on the right side. psc: Insert the hook in the next st, yo and pull up a loop. (Yo and pull through 1 loop) x 3 times (as for a ch 3). Yo and pull through both loops on the hook. 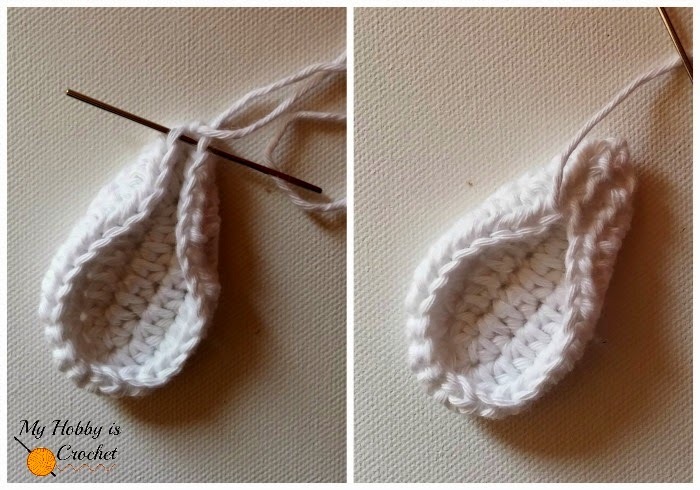 Watch the Video Tutorial Below to learn how to crochet the Picot Single Crochet! With white and 4 mm crochet hook chain 20. Row 20 (On the wrong side): 1 sc in first st and 1 sc in each of next 5 sts, (1 psc in next st, 1 sc in next st) x 8 times, 1 sc in each st till end of row, ch1, turn. Note: Work behind the psc sts from previous row, pushing them to front. Row 22 (On the wrong side): 1 sc in first st and 1 sc in each of next 4 sts, (1 psc in next st, 1 sc in next st) x 9 times,1 sc in each st till end of row , ch1, turn. Row 23 (On the right side): 1 sc in each st across, ch1, turn. Row 24 (On the wrong side): 1 sc in first st and 1 sc in each of next 3 sts, (1 psc in next st, 1 sc in next st) x 10 times, 1 sc in each st till end of row, ch1, turn. Row 1: (On the right side): sc2tog, 1 sc in each of next 5 sts, sc2tog , ch 1, turn leaving the rest of the row unworked for now. Rows 3-6: repeat as rows 3-6 for the neck's right side. R1: 1 hdc in 2nd ch from hook and 1 hdc in each of next 6 ch, 3 hdc in last ch. Fasten off leaving a long tail to sew the ears onto bib. Before sewing the ear onto bib, pinch the end together and sew a few stitches together as pictured below. With black make a magic ring, ch1, 7 hdc into ring, work one more hdc till half, having 3 loops o hook pick white and finish the st with white. Continue with white working 2 more hdc into ring, join with slst to first hdc at beg of round. Cut yarn. Fasten off, leaving a long tail from black to sew eyes onto bib. For the placement of the eyes refer to the main picture. Embroider NOSE and MOUTH referring to the bib's picture! Join white yarn with standing sc, one row below the ear. Continue with *1 psc, 1sc repeat from * around the face until you reach below the other ear. Cut yarn. Fasten off. Holding the bib with the right side facing you, attach yarn to right side of work, right above the ear, work sc sts evenly placed along the edge till you reach the top, with 2 sc into corner st, 1 sc in each sc on top edge; continue on to first tie: ch 50, 1 sl st in second ch from hook, 1 sl st in each remaining ch, sl st back to base of tie. Do not fasten off but continue on to trim along the neck edge: work 2sc in corner st, sc evenly down inside the 1th side, across front of bib and up inside the 2nd side of bib till top of 2nd side, 2 sc in corner. Continue with the second tie: ch 50, 1 sl st in second ch from hook, 1 sl st in each remaining ch, sl st back to base of tie. Continue to work sc across top, 2 sc in corner and sc evenly across the outer edge of the bib until you reach the ear. Cut yarn. Fasten off. Sew in the ends. BUTTERFLY APPLIQUE (optional): I have used a butterfly applique made a while back. Check out this post to get the link to the free butterfly pattern! Begin working with black/ other color yarn until row 19; change to white at the half of the last sc of row 9 (when having 2 loops on hook) and finish the sc with white, ch 1, turn. Don't cut black yarn, leave it where it is for now. Continue with white as in the pattern above, finishing the neck part. To have a nice look for the edging around the face, you will work an extra round with black. On the right side of the bib, pick the black strand and work 1 sc around the black face, with 2 sc into corners. Cut yarn. Fasten off. On the wrong side of the bib, work with white the Granule Edging around the black portion of the bib, then continue as for the white lamb bib above. Work Black Ears using the same pattern as for the white ones above. EYES: With black make a magic ring, 6 sc into ring, join with sl st to first sc. Cut yarn. Fasten off. Join white with a standing sc into back loop of a sc from previous round, working in blo, crochet 2 sc in each st around, join with sl st to first sc. Cut yarn. Fasten off. Sew in the ends. Embroider nose and mouth with a white/ neutral color. 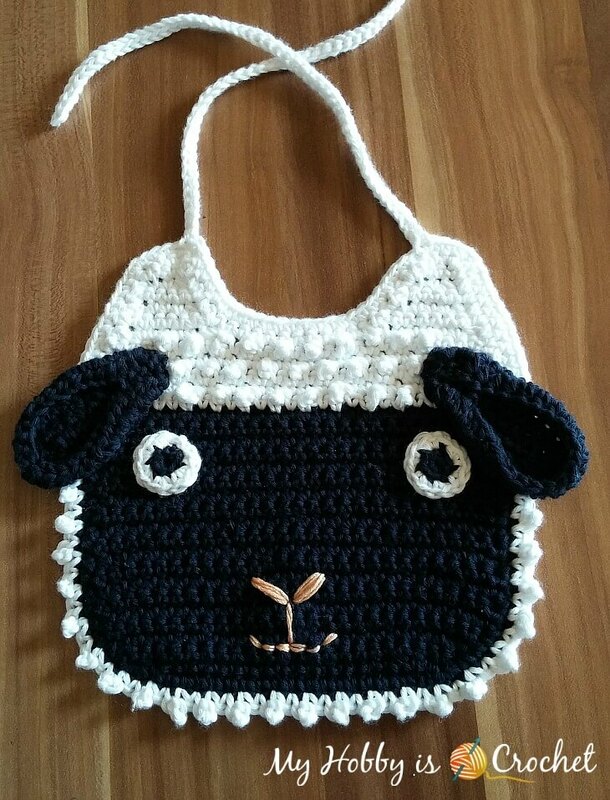 I am a beginning crocheter.I can not figure out the ears. Do you have a video for the ears? I have tried it several ways and can't get by the 1st row. Hi, I do't have a video tutorial. What can't you figure out? How to work on the other side of the foundation chain?